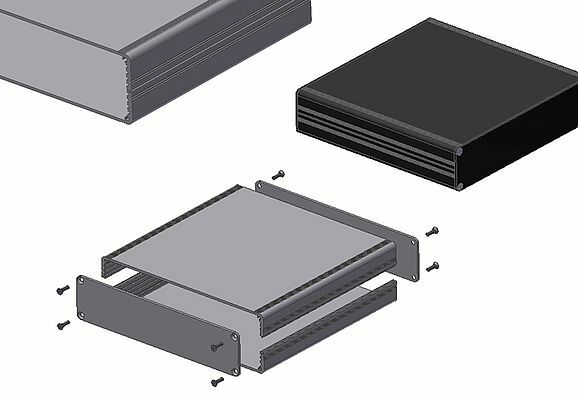 Fischer Elektronik has extended its range of miniature aluminum casings with functional, practical and shapely new casings that consist of two aluminum half shell sections. Their special geometry allows them to be fitted together and then fixed by front and back plates to form a tube. The guide grooves integrated into the profile allow insertion of European format cards with a width of 160 mm. In standard versions, the casings are available in six different lengths (100, 120, 160, 200, 220 and 234 mm), and two different finishes (natural or black anodized). These can also be modified to suit customers’ requirements both in terms of mechanical features and surface treatment.